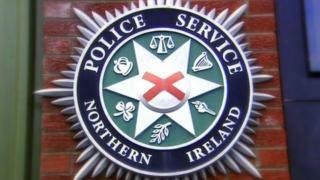 A man armed with a machete has challenged two people as they attempted to clamp a vehicle in north Belfast. It happened on Forthriver Road about 10:15 BST. Police said the two people were not injured, but were left shaken. Officers responded and searched a nearby property in Forthriver Crescent, where number of suspected cannabis plants were found. A man was arrested on suspicion of common assault, possession of an offensive weapon and a drugs offence. The 30-year-old was questioned about cultivation of a Class B drug and abstracting electricity.